It was my intention to write more than two posts a month, but time has been moving so fast, it was May before I knew it. Since I posted last, Beyonce released a new visual album (her best work to date), I’ve picked up my cap and gown (June 10th, wya? ), and I finished my clinical hours at OrthoVA (more on that later). I am now ten days away from my last day of school and 97 days from move in day at VCU, but who’s counting. Last Saturday, I “lost” my phone, but I knew it had to be somewhere around the house. So, no big deal right? Wrong! I couldn’t use Find My iPhone because it was dead and there was no sense in reporting it lost at the time because it was somewhere around the house. Before I knew it, Saturday turned into Tuesday and still, no phone. At this point I’m thinking my Mom is hiding it from me, as it could’ve been in a spot it wasn’t supposed to be. She wasn’t. My phone was really “lost”; I prayed that God would show me the way to it and He did. Friday afternoon, something prompted me to look in my makeup bag and what do you know, my phone was there. This is super embarrassing to tell people considering I use that bag nearly on a daily basis, but alas. I was elated that I found my phone because I felt that when I lost it, I lost myself (ha). What happened after I found my phone is the true joy of all of this mess. 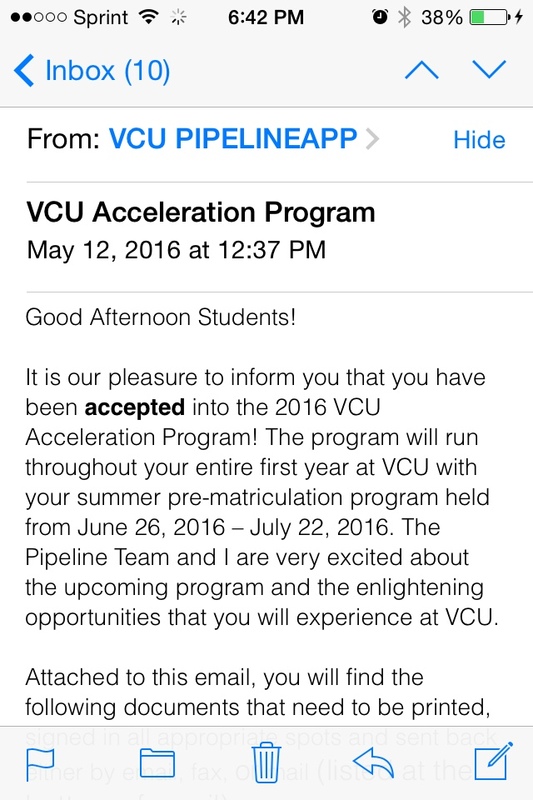 I checked my email and I saw that I had been accepted into the VCU Acceleration program! This is really huge for me considering I’ve been planning to participate in it since 10th grade. For those of you who are unfamiliar, the Acceleration program is for those who have been accepted into VCU and are interested in Pre-Health. So that includes, medicine, dentistry, nursing, pharmacy, and others. It’s meant to give students exposure in those respective fields and enrich math and science skills. For my entire Freshmen year, I’ll be living in a residence hall community with the other students that complete this program and we’ll be fulfilling other responsibilities as well. I applied to this program completely out of faith. I looked at the requirements and saw that my SAT scores were 20 points shy of the minimum 1000 combined math and critical reading score they wanted, but I applied anyway. The worst that could’ve happened was me ending up in the same position I started in anyway, so why not? 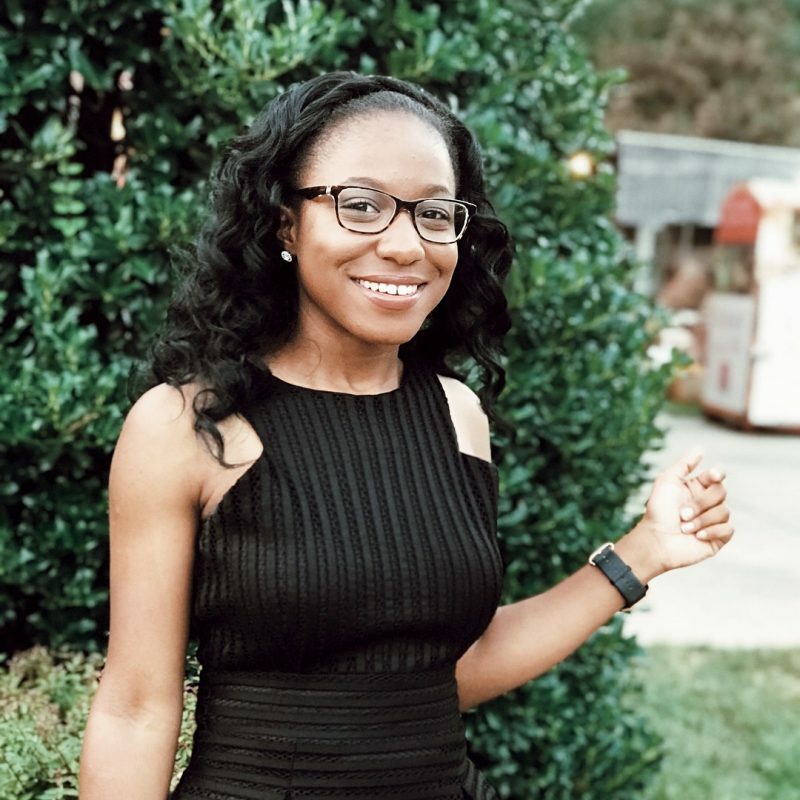 Here I am, set to embark on the first step of my PreMed Journey. I give thanks to God and my family for all of their support. I also thank all of you for reading!! Next Post I’ve Graduated, so Now What?